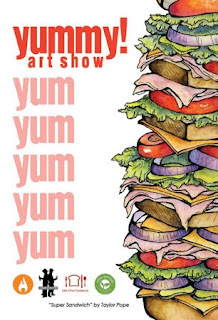 Come check out Yummy 3! Art show this show next Saturday 10/1! great artwork by over 20 local artists including Jeremy Germ Gedert, Karla Manzanilla Ross, Amy Neiwirth, Kellie Carter Gedert, Kathryn Harr Gorney, Adam Brouillette and more. It's at Brothers Drake Meadery, (great excuse to try the new Scarlet Solstice mead)!! plus great food from pattycake bakery and Two Caterers !! Also waffles from Belgium Waffles! Yummy indeed!